Bedroom arrangement is responsible, but enjoyable process. Any homeowner implies various forms of the interior as a result of his work. someone needs a relaxing, neutral atmosphere for quiet preparation for sleep, for others it is important to be able to be charged with energy and positive on waking in the morning. Modern bedroom design trends 2016 offer a choice to suit every taste. The all-time popular beige palette for bedrooms design is losing its ground. We increasingly see the snow-white interiors, effectively diluted by dark shades (predominantly gray and black) in the modern collections of dormitories` design projects. At the same time, all surfaces of the room are decorated in bright tones. Furniture, carpet and textiles act as dark accents. The use of accent wall as a focal center of finishing space is still used by many designers. Bright palette of the room has a positive effect on our emotional and physical state. White promotes appeasement, relax muscles, cleanse the thoughts. Not to mention the fact that white color perfectly blends with all the other shades of the color spectrum. Even pastel shades look impressive on a light background, not to mention a deep, colorful hues of furniture and decor. Bedroom with snow-white trim color needs accents. It can be a colorful shade of the bed frame or only of its headboard, colorful print of bed textile design or bright curtains in striped version. White color may be the optimal color solution for visual expanding the space of the modest-sized rooms. The snow-white finish of the ceiling and walls in combination with the dark flooring creates a visual height increasing of the space. Also, wall decor look particularly expressive and spectacular against the backdrop of white walls and dark furniture. Contrasting combinations make the interior more dynamic, interesting and modern. Recent trends of interior design does not make exceptions to the room where we spend most of the time in a dream. The use of dark gray and black shades make it possible to emphasize the original geometry of the room or to allocate a piece of furniture, textile design. Black and white bedroom is the trend of the coming season (for the umpteenth time maybe). You may use a combination of contrast both in the finish and in the choice of furniture and textile processing. Clean lines and rigorous forms, highlighted by dark shades, bring attractive geometric and elegant conciseness to the interior of the premises. Applying a black color for decoration of the ceiling and floor is appropriate in really spacious room with large windows and plenty of natural light. You should use another couple of elements of the interior of a similar shade (lighting, textiles and small ottomans, tables, stands) in order to balance the abundance of black surfaces on the background light walls and colorful furniture. The black color can be used in very precise doses in the creation of modern bedroom design. Small pieces of furniture such as a chest or dresser, floor lamp or chandelier, elements of ceilings and insulation systems engineering can become a highlights of the interior or its blotch instead. 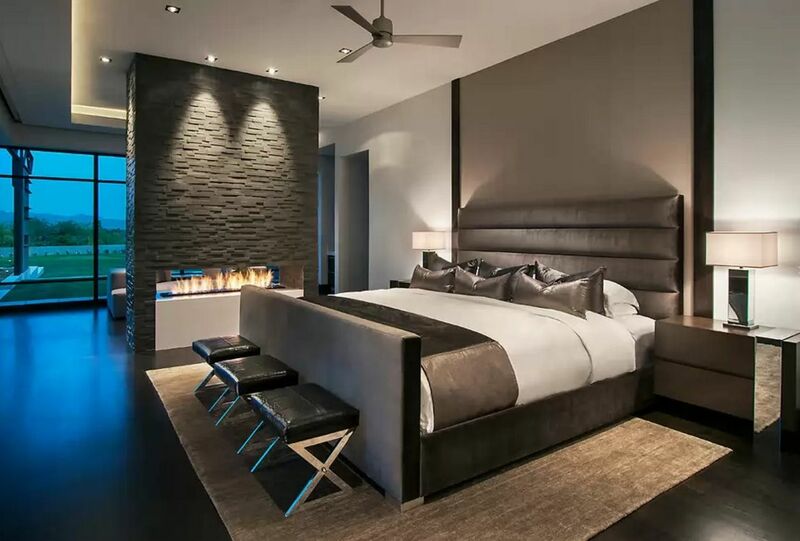 Using of a completely black accent wall in the interior of the bedroom is the design method for bold originals. But if this wall is located behind the headboard, then it will not become the part of the interior you see first on waking. But you can leave messages to your better half, draw and write a plan for a new day affairs on such a a dark plane. The black color in the company with brickwork adds not only industrial nature, but also notes of brutality to the interior of the bedroom. Of course, you should have a spacious room with large windows for such black finishes and inclusions of active elements of the interior. The use of wood or its high quality equivalent becomes a trend, thanks to the influence of eco-style in the formation of modern rooms design of different functional load. Bedrooms were no exception. The active use of wood paneling, lining and floor boards not only brings natural spirit to the room, it transforms it, raises the degree of uniqueness and originality of the space. Total clapboard or wooden facing panels trimming will not only bring the spirit of nature into the interior of the bedroom, but will also make it incredibly original. 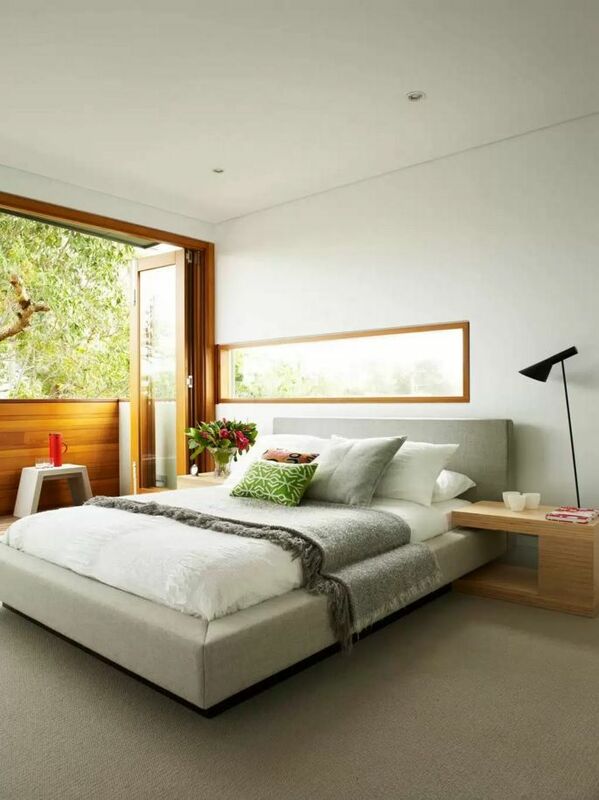 Use the original models of furniture and lighting to modernize the design of the room for sleep and rest. Using of wood trim for creation of accent surface is a frequent design method. You can use a natural material for lining the wall behind the headboard or arrange a plane which you will see first when awake – everything depends on your preference. I love this site! All the pictures you curate are super great, and I wish that you had them all automatically posted to your Pinterest page. I’d recommend looking into IFTTT (short for If this then that) which can automatically push things to Pinterest, Facebook, LinkedIn, and Twitter for you. (I use it for my own blog). Also, I’d recommend keeping all your social media consistent. Use “Small Design Ideas” instead of your name and picture. Use your blog logo across all platforms. It will make your brand more recognizable, which will encourage followers to follow you. You’ve seriously got a great blog!